Blind Spot Monitoring will detect objects and vehicles that are in your blind spot that you're unable to clearly see even if they are on the road. A lane assist feature helps to keep you in your proper lane while driving, which is beneficial if you're driving while tired or trying to find a destination and need to look at your navigation screen. There are monitors that will keep you a safe distance from the vehicle in front of you and warn you if there is a potential that an accident could occur from a vehicle getting too close to yours. 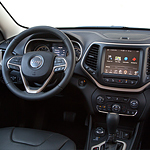 When you visit Sierra Blanca Chrysler Dodge Jeep Ram, you can examine where the monitors are located and how they work.